What are the strangest questions we've ever received in a question and answer period? I have been holding Bible prophecy conferences for over 30 years and my favorite part of each conference is always the question and answer period where we give people in the audience an opportunity to ask any question they please. In this series I'm going to start throwing questions about Bible prophecy at my two guest experts — Gary Fisher of Lion of Judah Ministry and Dennis Pollock of Spirit of Grace Ministries. I know you will enjoy their very fascinating and informative responses. Dr. Reagan: What are the strangest questions you've ever received in a question and answer period? Gary Fisher: Oh, we've had a lot of fun talking about this. I think some of mine were related to Y2K. I got emails from people asking me if I was going to sell survival equipment and build a bunker. Dr. Reagan: Did they ask if you would have machine guns? Gary Fisher: Yes, right, all that kind of stuff. But, we never promoted any of that. We just kept preaching the Word, and Y2K proved to be nothing, of course. Dennis Pollock: I did have someone ask me if I really believed that Barney the cartoon purple dinosaur was the Antichrist? Dr. Reagan: What?! How did that happen? Dennis Pollock: What happened was that I was reading an article tongue in cheek that was trying to make the point that anybody with a little reasoning and a little mathematics thrown in can prove that anybody could be the Antichrist. We were doing radio at the time when I read my article. I let the listening audience know at the beginning that this was just tongue in cheek and it wasn't real. I then went into this complicated formula using Barney's name and numbers and numerology and all these things to show point blank that Barney must be the Antichrist. Somebody tuned-in in the middle of that and that's what happened. He tuned-in in the middle of it hearing me prove that Barney the dinosaur was the Antichrist, so he had to know if I really did believe that? And, to let him know, no, I didn't believe Barney's the Antichrist. Gary Fisher: Bible prophecy attracts those who want to use the Bible as a springboard and then they go from there with their imaginations. I had this one email about a guy wanting to know if King Haile Selassie of Africa was going to become the resurrected Messiah. Was he going to be Jesus, and what did I think about that? I didn't know what to say about that. Dr. Reagan: I had a teenager one time ask me, "Is going to Hell like being sucked into a black hole in space?" I was once up in Coeur d'Alene, Idaho where there are a lot of survivalists and we had a question and answer period. I had never got such questions in all my life! What is the prophetic implication of the black helicopters that are going around all over the United States spying on us? What are the prophet implications of the thirty-thousand Chinese Communists troops that are on the boarder of China ready to invade the United States at any moment? What is the prophetic implication of the concentration camps being built all over the United States because the President is going to declare martial law and put us all in concentration camps? I mean, I just thought I was in Lala-land. Gary Fisher: I got a bunch of wild questions. Some guy will go on about something incomprehensible like, "What do you believe about the Lusahavren of the thirteenth harmonic of the square root of the...?" I want to go back and reply, "Would you care for another drink?" Dennis Pollock: The Bible tells us that self-control is one of the fruits of the Spirit. If you're going to be a prophecy teacher and answer these inevitable questions, well you've got to have self-control. Number one, there are questions that are going to come your way which will cause you to want to break out laughing, but you've got to hold back. Secondly, you are going to want to ask, "Are you crazy?," but cannot. 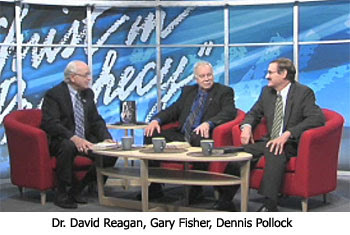 Dr. Reagan: One of the things that gives Bible prophecy a bad reputation unfortunately is that there are people who traffic in crazy theories and who love to create all kinds of rumors. In the next part of this series covering prophecy questions, our panel will ponder what questions reserved for our date with Heaven that they'd like to ask today. They'll also explain why the Old Testament is so important to understanding Bible Prophecy. Dr reagan i am reading ur book... Gods plan for ages.... and i can NOT put it down!! Thank you and nathan for the many blessings i receive from ur ministry!